Bedford Athletic won their third Midlands One East away game in a row with a 25-3 victory at Huntingdon on Saturday. At a ground that has proved difficult in the past, the wet weather was a deciding factor as it forced the side to rely on their forward prowess. Although clear-cut chances were limited early on, Bedford took points via James Mortimer penalties in the sixth and 11th minutes. A missed tackle allowed a Huntingdon break and when it was halted by captain Rob Watkins illegally, he was sin binned for 10 minutes, as Tad Chapman kicked a penalty to make it 6-3. Bedford coped well while a man down and in fact became more dominant. Five minutes before the half, Mortimer hit the post from a long penalty but the hosts did not clear and when Jake Foster broke to the line from a subsequent lineout, accurate passes found prop Tony Moliterno who dived over in the corner for his debut first-team try. An 11-3 lead at the half gave Bedford breathing space and although they were playing uphill in the second half, the rain briefly stopped allowing for a faster game. Relentless pressure eventually saw Nick Thomas break through the centre of a ruck and when the ball was recycled, winger Stephen Woodhead was in support to cross for his seventh try of the campaign. Mortimer converted as he did for the next try when Harry Sawford-Smith ran a good line to set Josh Cassell free to extend the lead to 25-3 on 52 minutes. Athletic were now totally dominant but when the referee awarded a debatable penalty against them for crossing they had to prove their mettle by holding out a series of attacks on their own line. With strong carries from Thomas, Watkins and John Clarke in particular the pressure was lifted and in the final 10 minutes the visitors went in search of the bonus point try, but couldn’t manage it. 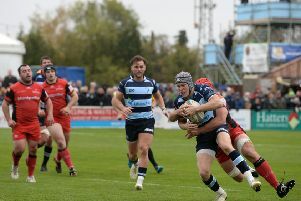 Bedford finally have a home game when they entertain last season’s play-off finalists Kettering on Saturday.